On behalf of CUER, Professor Bratspies recently participated in an on-line dialogue about green roofs as a climate justice strategy. After identifying the legal barriers to widespread adoption of green roofs, Professor Bratspies made the case that that green roofs on NYCHA buildings could go a long way toward ameliorating environmental inequities that poor communities bear. “In terms of making an impact, the New York City Housing Authority (NYCHA) is an obvious target,” Professor Bratspies wrote in the Nature of Cities. “NYCHA is the single biggest landlord in New York City, overseeing 2,553 residential buildings that are home to nearly 5 percent of New York City’s residents. NYCHA’s combined real estate holdings are roughly three times the size of Central Park. Even more exciting, Amosh Neupane and Kate Scherer, from long-time CUER collaborator Global Kids, also participated in the dialogue, bringing a much-needed youth perspective to the discourse. 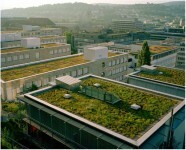 “Cost issues often deter public schools from even considering the idea of a green roof. However, there are ways to build green roofs at lower costs with minimal maintenance—this is what we aimed to do (and did!) at Global Kids back in 2013,” Neupane and Scherer wrote, referring to Global Kids successful effort convincing Long Island City-based William Cullen Bryant High School to install a green roof. The full dialogue can be read here.